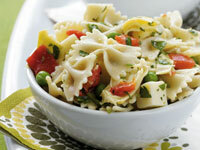 Indulge in carbs and and melt the fat with this pasta recipe from Health’s The CarbLovers Diet. This delicious dish from Healthâ€™s The CarbLovers Diet (out in August; pre-order it here) is full of Resistant Starch, a type of fiber that keeps you full and burns fat. Cook 8 ounces dried farfalle according to the package instructions. Meanwhile, combine zest and juice of 1 lemon and 2 teaspoons olive oil in a large bowl; whisk. Add a (13.75-ounce) can artichoke hearts, drained; 8 ounces fresh part-skim mozzarella cheese, chopped; and Â¼ cup chopped bottled roasted red bell pepper; toss to combine. Place 1 cup frozen peas in a colander; drain pasta over peas. Add pasta and peas to artichoke mixture; toss. Garnish with chopped fresh parsley, if desired; serve. Frances A. Largeman-Roth, RD, is Healthâ€™s Senior Food and Nutrition Editor.